Free USB Drive Restore Download from FilesPack.com! USB Pen Drive deleted data retrieval software retrieves corrupted files folders of different removable medias such as thumb drive, sD, mini pen drive, flash drive. Restore the formatted JPEG, JPG, GIF, BMP, PNG, TIFF, RIFF photos, pictures, images recover the lost MPEG, MPG, mp3, 3gp, MOV, AVI, WAV video, audio file formats. Tool support Windows XP, 2000, 2003, 98, ME, NT operating systems for erased information recovery. Utility repair and unformat the damaged power point (ppt), Access, acrobat reader (pdf), text (txt), word (doc) documents. Software also support the different pen drive brands like BENQ, YAKUMO, RICOH, SAMSUNG, KONICA, SANYO, CASIO, PENTAX, MINOLTA, CANON, ACER, SONY, EPSON, HP, FUJI FILM, JENOPTIK, ROLLEI, TOSHIBA, LEXAR, VIVTAR. Software is non destructive and easy to handle since it provides user friendly graphical user interface (GUI) and it has only read permission so it can?t corrupt the users working directories and file systems. * Tool can recover JPEG, JPG, GIF, TIFF, PNG, BMP, RIFF images, photos, pictures 3gp, mp3, mp4, MIDI, MOV, DAT, AVI, WAV videos Power point (*.ppt), MS Word (*.doc), PDF, Excel (*.xls), Access (*.mdb), and Text files. * Repair logically corrupted external removable storage media like memory sticks, USB drive and pen drive of all types due to hardware and software malfunction, improper handling, virus attack. * Software is read only, non destructive and easy to handle since it provides user friendly graphical user interface (GUI). * Recovery is possible even if the drive has been re-formatted. * Ensures recovery even if the pen drive has been pulled out from port without having in safe mode. 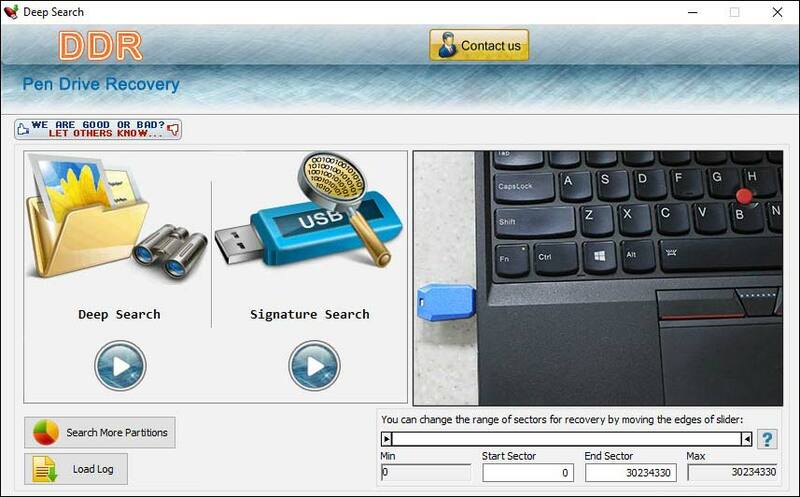 You can free download USB Drive Restore 2.0.1.5 now.